Burnout is a very common thing among us medicos. That spans from being a medical student upto a resident or even a consultant sometimes! We feel stupid most of the times and some of our seniors have that bad habit of making the juniors feel bad. But trust me, you WILL become as good as them, and even better! Medical field needs experience and alot of reading. Med school teaches us maybe 1/10th of what we should know as a doctor. And the remaining we learn on the job. There is always more to learn more to read and more to understand but medicine is not a lonely game. Always refer, and ask! In Medicine, 2 brains are always better than 1 brain. Don't feel shy or bad to ask for help. Use your head! If they belittle you, tell yourself you will learn it. Smile and move on. For me each time I lose motivation, I watch an episode of a Medical TV series. It could be HouseMD, The Resident, New Amsterdam, Good Doctor, Chicago Meds, or any random episode I find in Youtube. Watching them gives me the feeling of impact I can have in others' lives. I also go through Youtube videos from famous Medical youtubers, few of my favorites are Jane and Jady, TheStriveToFit, Ali Abdal, DoctAura etc. They have amazing study tips and other medical related things that can give you the motivation to read and learn. Sometimes I go through #Studygram handle in Instagram. There are many colourful notebooks and workspaces, it really inspires me and gives me a free mind to study. I also like to read the study tips written by my fellow authors. They have eye opening and motivational tips that really makes me go sit and get that one chapter done. If all these don't work, just listen to your favorite songs and move your body a little bit when your room mates are not watching!  It definitely gives some positivity to shrug off that sad burnout feels. Yes! I find most of my inspiration and motivation by online activities rather than going out and resting under the trees. One reason being Im not a very outgoing person and another being I have very little time as a Junior Intern. And also it helps to clean your room. And cooking a meal for you and/or your family/partner. It would leave you with a clutter free environment and a tasty meal to eat. And if things go well, a lot of praising for your yummy food by others with make your self esteem get better too. You don't need a trip to beach or hike to mountain, but sometimes sleep on a cozy bed with newly washed sheets, after a warm bath, applying your favorite night lotion, a drop of nice smelling essential oil behind your ears and wearing relaxing clothes will refresh you too. These are few of my techniques to feel good after a toxic day with disastrous rounds. But what is most important is, NONE of us gave up! I take this time to thank my Medicowesome family for helping each other and even helping me rise up in such times when I was so low. Behind the groups and the blog, we are an amazing group of friends although many of us have never met each other. 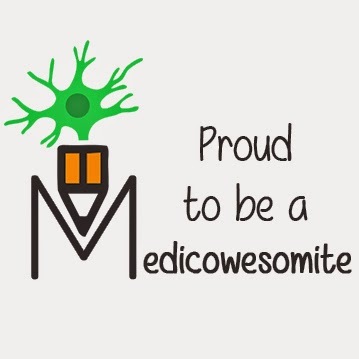 Medicowesome is my support group, and we all need one including you. Find your supportive group, and for the records don't forget we at Medicowesome as also on your back, ready to hold you up. Stay strong and comment or message us about your methods of tackling a toxic day or a burn out session. So we all can learn from it. Keep it up! Take care and always....be awesome! What Is Going On In Migraine?